One of the most eminent contemporaries of Rembrandt was Jan Vermeer (1632-1675), of Delft, also sometimes referred to as Vermeer of Delft or Johannes van der Meer. Vermeer pursued a course of great independence and seems to have been influenced by no other master except, to a slight extent, Karel Fabritius. Young women engaged in all kinds of household work or in the more congenial occupation of love-making, interiors, and street-scenes, are the favourite sub­jects of this rare master, all wondrously pure in colour, abounding in delightful effects of perspective, full of life, at once truthful and charming, entitling them to rank amongst the gems of Dutch art. 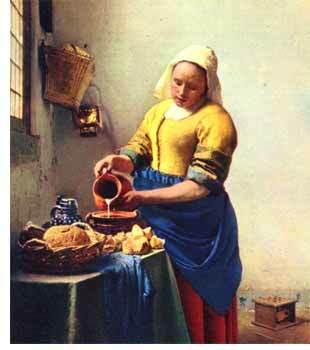 Some of Vermeer's famous paintings are: "The Milkmaid", "Girl with a Pearl Earring" and "View of Delft". Both during his lifetime and afterwards his style was frequently imitated. Read more information on Jan Vermeer and his paintings.